The life of our products is an important factor you should consider when determining the maintenance and/or inspection timing of your equipment. This section explains the definition of life for each of our products. Since the life is not a guaranteed value, please use it only as a reference for proper maintenance and inspection. The motor life is affected by a number of factors, such as deterioration of insulation performance, wear of sliding parts and deterioration of bearings that all affect the functions of the motor. However, in most cases the life of the motor is determined by the bearings. The bearing life is represented in terms of grease life and bearing mechanical life, as described below. The motor life is estimated based on grease life, since the bearing life is more affected by grease deterioration due to heat than the load applied to the bearing. Temperature is the primary determinant of grease life, meaning that grease life is significantly affected by temperature. 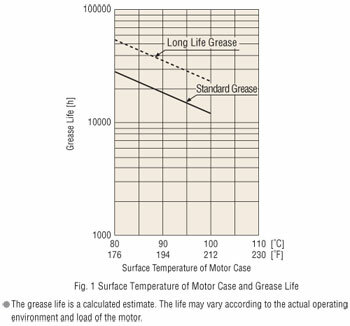 The graph below shows the grease life with regard to the motor case's surface temperature. Also note that some motors employ long life grease, which achieves approximately twice the life of conventional grease. 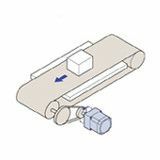 Use the motor in conditions where the surface temperature of the motor case does not exceed 90°C (194°F). Use the motor in conditions where the surface temperature of the motor case does not exceed 100°C (212°F). Because of the effects of ambient temperature and running duty, the lower the motor surface temperature, the longer the motor life becomes. In rare occasions, such as when the motor is subjected to a large overhung load, the mechanical life may end before the grease life. The gearhead life is reached when power can no longer be transmitted because the bearing life has ended. 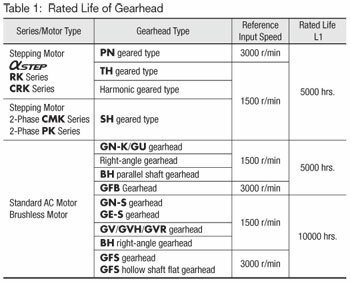 Therefore, the actual life of a gearhead varies depending on the load, how the load is applied, and the operating speed. Oriental Motor defines life under certain conditions as "rated life," based on which the life under actual operation is calculated according to load conditions and other factors. The tooth surface of Oriental Motor's gearheads is lubricated by a grease lubrication mechanism. Oiling is not required. Lifetime under actual conditions of use is calculated based on the operating speed, load and load type, using the following formula. The calculated lifetime represents the actual driven hours. 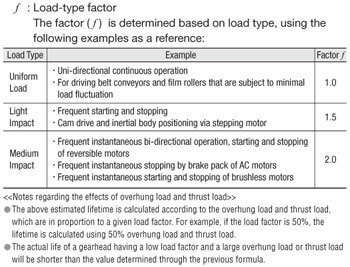 The average torque may be considered operating torque if the gearhead is subject to load while starting and stopping only, as when driving an inertial load. 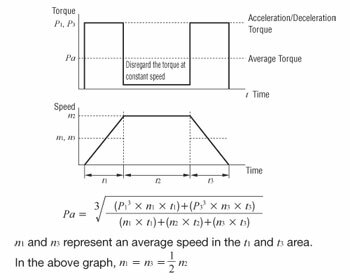 The calculation of average torque is explained later in this section. Permissible torque represents the specified values listed in the product catalog and operating manual. The stepping motor is used for intermittent operation of an inertial load, such as driving an index table and arm. If the stepping motor is used in such an application, the average torque shall be considered the operating torque, as described below. 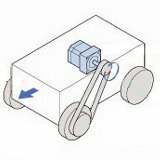 The load factor for driving an inertial load using a standard AC motor or brushless motor shall be 1.0. The graph below shows torque generated when driving an inertial load over a long operating cycle. Friction load caused by bearings and other parts during constant speed operation is negligible and therefore omitted. When driving an arm or similar object, the gearhead may be subjected to load fluctuation as shown in the following graph. For example, such load fluctuation will occur when driving a double-joint arm or moving an arm in the vertical direction. In such an application, the average torque shall be 75% of the maximum acceleration/deceleration torque, as shown in the following formula. An increase in gearhead temperature affects the lubrication of the bearing. However, since the effect of temperature on gearhead life varies according to the condition of the load applied to the gearhead bearings, frame size and many other factors, it is difficult to include the temperature effect in the previous formula to estimate the lifetime. The following graph shows the temperature effect on the gearhead bearings. 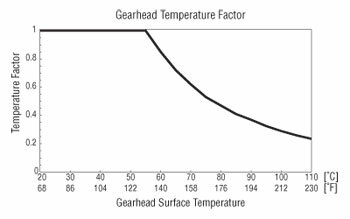 The gearhead life is affected when the gearhead's surface temperature is 55°C (131°F) or above. In some cases, a lifetime of several tens of thousands of hours may be obtained from the calculation. Use the estimated life as a reference only. The above life estimation is based on the bearing life. An application in excess of specified value may adversely affect parts other than the bearings. 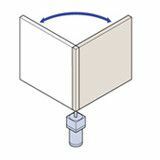 Use the product within the range of specified values listed in the product catalog or operating manual. The life of each of Oriental Motor's circuit products is determined by the aluminum electrolytic capacitor inside the product. Our circuit products are designed so their useful life will be reached after at least five years when the product is used continuously under and ambient temperature of 40°C (104°F) (excluding certain models). In addition, an aluminum electrolytic capacitor generally exhibits the characteristic according to the "Arrhenius equation." 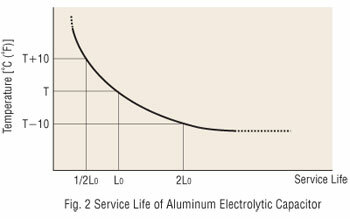 Specifically, a temperature rise of 10°C (50°F) reduce the life of an aluminum electrolytic capacitor to half, while the temperature drop of 10°C (50°F) will extend the life to twice as long. Since the lifetime of a circuit product varies depending on the operating environment and conditions, Oriental Motor recommends that the curve shown in Fig. 2 be used to determine the need for preventive maintenance to keep the product free from failure. 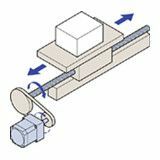 The life of a motorized linear slide and motorized cylinder is generally affected by the rolling fatigue life of its ball screw or linear guide. When stress is applied repeatedly to the raceways and the rolling ball, flaking (a phenomenon in which the metal surface turns into small scale-like pieces that separate from the base metal) occurs due to material fatigue caused by rolling fatigue. The rolling fatigue life refers to the time until the flaking occurs. 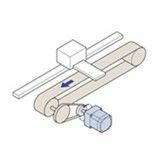 The life of a motorized linear slide is determined from the maximum thrust force applied to the ball screw as well as the maximum transportable mass and moment load applied to the linear guide. The life values specified for our products are not guaranteed. A reference traveling life for the EZS II Series is 5000 km (3000 km for EZS_E). 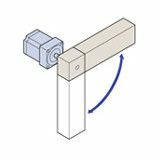 The life of a motorized cylinder is determined from the maximum thrust force applied to the ball screw. Since the life of each ball screw is varied, a rated life is calculated for each product based on its maximum ratings (maximum transportable mass, maximum speed, etc.) 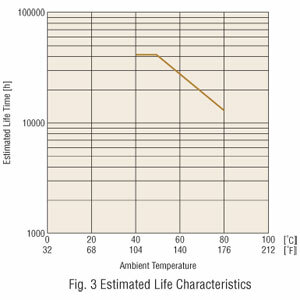 as a reference for calculating the product's life. The life values specified for our products are not guaranteed. A reference traveling life of the EZC4/EZHC4/EZHP4 models is 500 km and EZC6/EZHC6/EZHP6 models is 3000 km. Also note that the life of each product varies depending on a number of factors, such as conditions and environment under which the product is used. Use these values only as a reference. Fan life represents the condition in which the fan's blowing ability has deteriorated due to continuous operation for a certain period of time, or the fan can no longer be used due to significant noise. 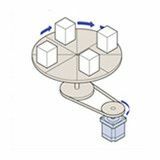 Rotation life can be easily measured as well as the factors involved can be clearly specified numerically. This is usually what is meant when referring to life. 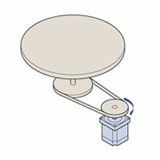 Acoustic life, on the other hand, is defined by an increase in decibel level, while determining exactly what amount increase marks the end of acoustic life depends on the user's judgment. Moreover, fans can still meet operating requirements even after reaching the predetermined increase level in noise. In general, standards relating to noise and the length of acoustic life have not been established. Oriental Motor defines life by rotation life; a fan is judged to have reached the end of its life when speed drops to 70% of the rated speed. Cooling fans use a ball bearing. The following explanation applies to the life of a ball bearing. Since the load applied to a fan's bearings is negligible, life of a fan is determined by the deterioration of the grease in the bearings. Since the fan's operating and starting torques are significantly smaller than those of a motor, lack of lubrication due to grease deterioration will cause the starting and dynamic torques of the bearing to increase excessively, which may prevent the fan from starting. Deterioration of grease also increases the noise generated. Grease life is given by the following formula. Fig. 3 gives the estimated life characteristics of the bearings of the compact AC fan MU1238A. This characteristics is obtained by measuring the temperature rise of the bearings of the fan at the rated voltage and estimated life using the formula for bearing grease life. Other than standard speed, the MD fan has middle and low speed types available. The following explains the service life using each speed type available on the MD925. The table above shows that the low speed type with lower input has a longer life than the standard type with a higher input. Therefore, it can be said that in order to make the service life as long as possible is to use middle-speed or low-speed type. 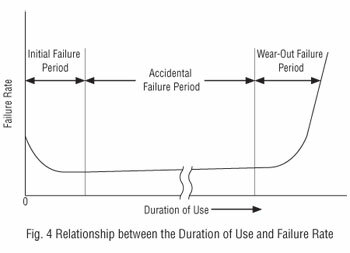 Generally, failure rate of parts relative to the duration of use fits the pattern of three states: initial failure, accidental failure or wear-out failure, as shown in Fig. 4. The risks of initial failures are eliminated in the inspection process of the production line, but accidental failures are sudden failures that occur randomly and unexpectedly during the durable life of the product before wear progresses. Therefore, it is difficult to provide engineering protection against accidental failures, and the only measure available presently is to predict occurrences based on statistical data. Wear-out failures occur at the end of the product's durable life as a result of deterioration and wear. The rate of wear-out failure increases dramatically after a certain period. Replacing certain parts at this point will provide an effective means for preventive maintenance. (Excerpt from "Recommendation for Periodic Inspection of General Inverters" by the Japan Electrical Manufacturers' Association).